On a recent weekend trip with my five year old, I took him to Boothbay Harbor, Maine. One of his favorite things to do is watch an old salt water taffy machine that cuts and wraps taffy. While one flavor is being fed into an automated cutting and wrapping machine, another flavor is being stretched and rolled on a taffy pulling machine. The whole process is quite efficient and allows one person to fill a large bucket with taffy in 15 minutes. If something goes wrong however, such as too much taffy is going in the hopper, then things can go wrong pretty fast and output drops to nothing as the machine is stopped and setup again. Agile software development reminded me of this process, as teams are often trying to optimize the flow of work from development to delivery and to do it in small chunks and as efficiently as possible. Of course software development is much more complex, often with distributed teams, communication issues, and making sure you work on the most important things first. How do you steer and automate the software development process and improve both quality and efficiency? What are some of the new capabilities in IBM Rational Collaborative Lifecycle Management (CLM) 5.0.1 that help you keep teams moving forward without getting stuck? “I need to visualize and optimize the flow of work.” Use the new Taskboard and Kanban board. Many teams are using a combination of scrum and Kanban methods so we’ve made it much easier to visually manage and optimize the flow of work with our new taskboard and Kanban board views. The new boards track all work item state transitions as sub-columns on the display to match the natural way you would organize tasks on a physical board. Cards on the board are now configurable and can be customized to display only attributes you want to show, including custom attributes. To help manage screen real estate, cards now come in three sizes, small, medium and large, making it easy to zoom in on detail or take a higher level view. To make drag and drop intuitive, we added a cool usability feature (see Figure 1) where we highlight in green the valid state transitions as you drag the card across the board to drop it on a green state in the workflow. On the Kanban board we’ve improved “work in process” (WIP) limits to make them easier to configure and simpler visual indicators of status. Finally, to make the Kanban board easy to locate, we added a Sprint Kanban board to the scrum process template as a default plan type … so start steering those standup meetings and keep the whole development team in the loop on daily progress. “I need to quickly collaborate with other team members.” Use automated work item reply. We’ve added a social comment flow to work items with avatars and timestamps to enable more a natural flow. A new reply to action on a comment now automatically adds an @user link and “comment #” link to your reply to speed up a common collaboration workflow between users. No more wasting time looking up user-id’s to respond to others on the extended team (see Figure 2). “I need to collaborate on a story mockup.” Manage attachments, and view PDF files in place. In Rational Team Concert (RTC) 5.0.1 you can easily upload multiple attachments from the file system and drag them into the web UI. Attachment upload progress status is displayed. Want to view a PDF file that is attached to a work item without downloading it? You can now preview attachments that are PDF files or HTML videos right in the work item web UI without having to switch contexts. “I need to know which change set broke the build.” Jazz SCM shows who delivered what and when. Is your software “taffy” machine stuck? Are you frequently trying to determine which change set introduced a problem into your integration build stream? In RTC 5.0.1, the Jazz SCM history feature now shows who delivered what changes to the current stream and when. This information is available in two new columns Added By and Date Added. You can view the history of a stream and see the person who delivered the change sets or baselines. This helps you determine which features need to be rolled back to keep the current stream green and moving forward (see Figure 3). Figure 3: Who added what feature and when? “I need to quickly and simply create and manage reports for my team or a team of teams.” Introducing the new lightweight Jazz Reporting Service. Does your company need to know the status of taffy production and potential blockers? With CLM 5.0.1 anyone has the ability to easily create their own reports in a powerful and easy-to-use interface (without requiring Cognos expertise) using the new lightweight Jazz Reporting Service (JRS). 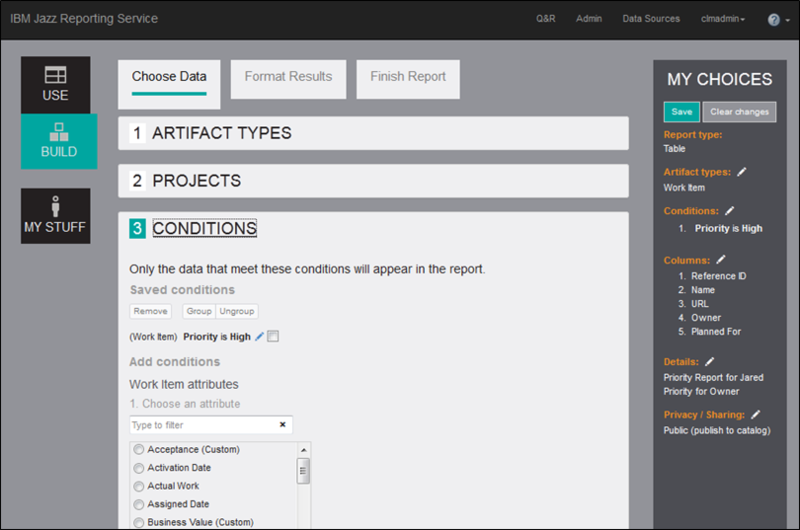 Users can now create table-based reports for a single artifact type, and select the set of characteristics to filter on. For example, show me all the blocking defects in my project or across multiple projects. These reports can then be displayed in a CLM dashboard or easily exported to Microsoft Excel. These are just a few of my favorite features in CLM 5.0.1, but there is much more available including significant plan loading performance improvements and many enhancements for teams developing on System z environments. You can read about all the features in CLM 5.0.1 here in the new and noteworthy for each CLM solution. “I need to quickly see and create my work and my teams work.” Try the RTC Quick Planner (tech preview). We have a new “flavor of taffy” we’d like to get your feedback on. In RTC, we have been focusing on making the user experience for developers faster and more productive. Our goal is to produce software that delights developers in its simplicity. You can see some of this early work in our RTC Quick Planner technology preview that is available to experiment with on RTC 5.0.1. Our goal with RTC Quick Planner is to address the ability for an agile team to rapidly create work items and focus on the work of the developer and the team at a fast and fluid pace. RTC Quick Planner also allows teams to manage their own backlog and sprints in a single window without context switching. To read more about RTC Quick Planner and see what it can do, see our development wiki. You can download and install RTC Quick Planner on an RTC 5.0.1 installation. It’s not yet fully supported for production use within RTC, but it gives you an idea where we intend to head. If you want to give us feedback on RTC Quick Planner you can comment in the following work item 325485. Oh, and by the way, if you are curious what that taffy machine looks like, see: Downeast Candies Taffy Machine. Enjoy using CLM 5.0.1! We believe we’re on the right track, so feel free to comment and let us know what you think. Great to see the Quick planning in RTC. I have been using it in IBM DevOps Services (https://hub.jazz.net/) and I have found it very useful. I like the concept of tabular reports. I have been talking about them for a while internally and with our account reps, bluntly, there are not enough of them for my organization… While graphical reports are fine for trending, they are no match for hard numbers when you need to manage the numbers precisely.